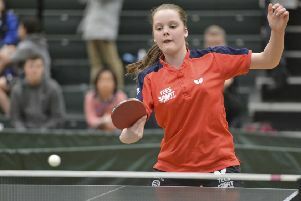 Sally Stott in action for England. A Slyne rugby player has once again been selected to play for England. Sally Stott, of the Vale of Lune and Edinburgh University, has been included in the 31-strong England Women U20 squad that will come together to take on Canada during a two-week residential camp in Nottingham in August. Stott has already been in action for England against France earlier this year. The three games against Canada at Nottingham Trent College take place on August 18, 22 and 26. Coach Jo Yapp said: “We were really impressed with the quality of rugby we saw at the recent trials and that really demonstrates how the standard is improving year-on-year. Elsewhere, a second row forward from Morecambe will be plying his trade in the Aviva Premiership next season. Glen Townson was part of the Bristol Rugby squad that secured promotion with a two-leg victory over his former club Doncaster Knights in the Championship final. The 29-year-old former Newcastle lock, who came through the ranks at Sale, missed the game with a knee injury but is on the road to recovery.